Definition at line 104 of file locator.c. Definition at line 124 of file wbemprox_private.h. Definition at line 106 of file locator.c. 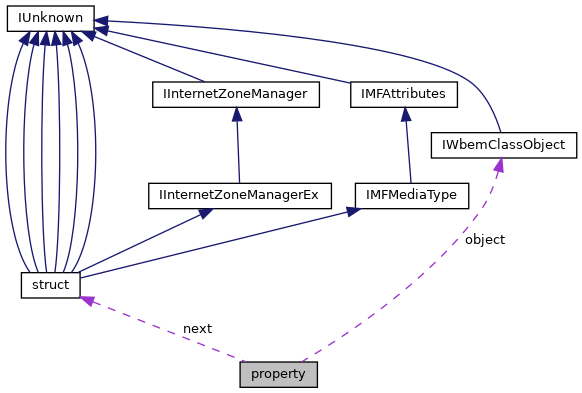 Referenced by impl_from_ISWbemProperty(), and property_Invoke(). Definition at line 109 of file locator.c. Referenced by alloc_property(), eval_propval(), is_selected_prop(), tmdump::schema_scan::operator()(), property_get_Value(), and property_Release(). Definition at line 123 of file wbemprox_private.h. Definition at line 125 of file wbemprox_private.h. Referenced by alloc_property(), count_selected_properties(), and is_selected_prop(). Definition at line 108 of file locator.c. Referenced by property_get_Value(), property_Release(), and SWbemProperty_create(). Definition at line 107 of file locator.c. Referenced by property_AddRef(), and property_Release().